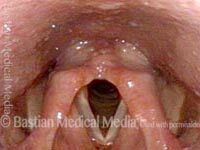 A nonorganic disorder in which a person’s vocal cords partially or fully close during breathing, which causes noisy breathing. Also called vocal cord dysfunction (VFD) or vocal cord dysfunction (VCD). The fundamental disorder is not in the mechanism itself, but rather in the patient’s “use” of the mechanism. 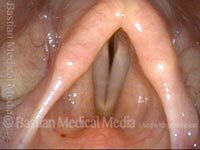 Consciously or sub-consciously, the patient inappropriately narrows the space between the vocal cords, usually for secondary gain. Unlike with asthma or nonorganic breathing disorder of the trachea, the noisy breathing is mostly heard when the person breathes in (inspiration). Still, on occasion, individuals with this disorder are treated for years as having asthma before this diagnosis is finally made. Normal quiet breathing with vocal cords widely abducted. Typical posture of vocal cord dysfunction, with vocal cords only slightly abducted. If air is drawn into the lungs in this posture, the vocal cords are brought into vibration and make inspiratory phonation (see blurring of the margins). For comparison, same patient, normal (expiratory) phonation. Nonorganic breathing disorder in a patient who makes loud inspiratory noise with athletic exertion. Images shows functional partial closure during inspiration as a nonorganic phenomenon. Normal abduction of vocal cords with elicited sniffing. Note the convexity and vibratory blurring of the free margins, correlating with inspiratory phonation. This video portrays a breathing abnormality that is non-organic / functional.